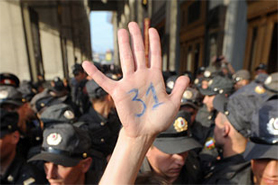 Russian opposition leaders working to organize the next set of Strategy 31 rallies in Moscow have again decided to hold two separate events, Kasparov.ru reports. On Tuesday, the two groups handed in their applications for permits to hold rallies in defense of free assembly on Moscow’s Triumfalnaya Square on January 31. The city government has begun to grant permission for some of these rallies in the past few months, but not without complications. Former Soviet dissident Lyudmila Alexeyeva was one such applicant, asking for a permit to allow 1500 people to attend her rally. Other Russia party leader Eduard Limonov and Left Front coordinator Konstantin Kosyakin, along with the recent addition of former dissident Vladimir Bukovsky, applied for a separate 2500-person permit as well as permission to hold a march after the rally. According to Other Russia member Sergei Aksenov, the larger figure was based on police estimates of attendance at previous rallies. Until last October, Alexeyeva, Limonov and Kosyakin had worked together to organize all of Moscow’s Strategy 31 rallies. The group split apart after Alexeyeva obtained city permission to hold the October 31 rally with an 800-person cap. Feeling that this limit was illegal, Limonov and Kosyakin broke off and chose to hold their own, unsanctioned event concurrently with their former compatriot’s. Alexeyeva spoke out against the idea of a march, stipulating that this was her “personal opinion.” Limonov and Kosyakin plan to have their ralliers march down Tverskaya Street towards the Kremlin following the rally on Triumfalnaya Square. “It could have been done, but – first of all, this is harder to do in the winter, and secondly, after these events [the detention of participants of the rally on December 31 – ed. ], I don’t know in general what’s going to happen,” said Alexeyeva. “We need to clarify what happened at the rallies, and not announce a march,” she went on, noting that there had been no talk of a march at a meeting between all of the organizers on January 14. Still, he did not expect the application to be approved. “I’m optimistic. I hope that the government has the sense to grant us sanction, but I think that now, since it’s the first time, there won’t be any sanction,” Aksenov said. Meanwhile, the pro-Kremlin youth group Young Russia has set about to derail both rallies by holding one of their own. Organizers of “Donor Day,” a diversionary tactic that the group has used multiple times to take up space on Triumfalnaya Square that would otherwise go to the oppositionists, are demanding priority consideration for their rally on the basis that they supposedly handed it their application first.